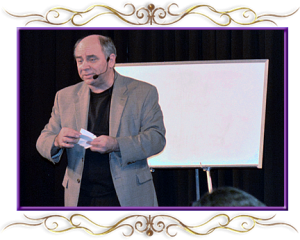 Professional magician Jim Combs can perform magic, comedy magic and mind magic for any organization or event. This show is designed and scripted to entertain all ages. Mixed groups of children, teens and adults or adults only. The show is fast paced, interactive and has something for everyone. 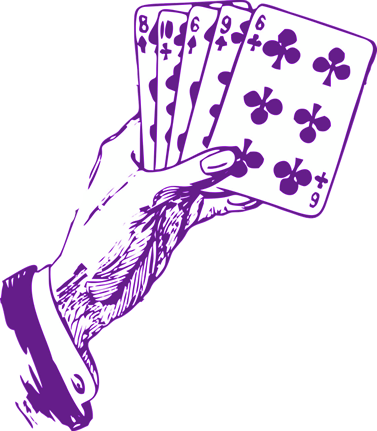 Includes parlor or stage magic, comedy, mentalism, card magic and illusions. Children, teens and adults may take part in the show as volunteers. The show may run 30, 40, 50 or 60 minutes in length. The Rohr Center for Jewish Life – Chabad House in Haverford, PA.
Olympiad Gymnastics in Newport De. 9th. Annual Dining Under The Stars in Media PA.
for Elementary, Daycare/Preschools, Librarys and Parties (Birthday, Christening, Communion & Confirmation). These shows are a little slower in pace than the family shows and are for younger children ages 3 to 6 years old. I have included several effects that include basic numbers, alphabet letters and animal recognition as well as a few stage illusions. Although my children shows are very funny and silly, I take performing magic for children very seriously. The responsibility of a children’s entertainer is to be encouraging, be aware of the children’s unique personality, build up their self-esteem and leave a positive lasting impression. 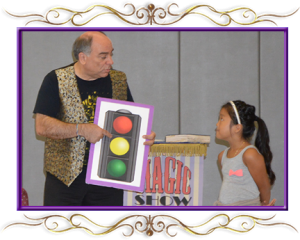 In my show it doesn’t matter if a child is shy or outgoing they have fun and can interact as they choose. This show may be 30, 40, 50 or 60 minutes in length. 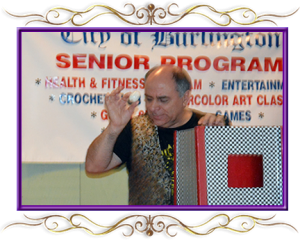 The Senior’s Magic Show is a relaxed paced comedy magic program for residents of senior living and elder care facilities. I use effects that are very colorful such as color changing silks and color changing feather wreaths as well as classic effects such as pulling eggs, silks, flowers and a glass of milk from an empty hat. I also use a few one liners from the vaudeville era as well as Milton Berle and Henny Youngman. During this show I perform a small routine that is a homage to the Great Carl Ballantine. Carl was mostly known for his roll in 1960s TV series McHale’s Navy but he was also the first magician to play in Las Vegas and was known by magicians as the father of comedy magic. The music behind the show is 1950s instrumentals such as; Caravan, Moon Glow, Sleep Walk, Hot Toddy and Whispering. This show may be 45 or 60 minutes in length. 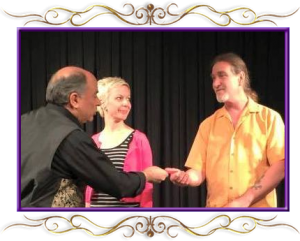 My adult magic shows are full of clean adult fun, humor, classic magic and mentalism and lie detection. Group Lie Detection test: I bring up 3 or 4 volunteers and present them with a simple test. I give them a statement to complete they mix in one true answer and 3 lies. By watching their body language, listening to their voice I determine when they are lying to me and when they are telling the truth. Group ESP Test: 4 volunteers are brought up and I show them 3 groups of 5 different EPS cards. 2 sets are for them and one set is mine. I choose one of my 5 cards and place it in an envelope in plain view. The four people each get a chance to randomly shuffle the 2 sets of cards and then are given the two top cards to keep. At the end of the routine each volunteer has chosen 2 identical ESP cards and leave me with two cards that match the card I placed in the envelope at the beginning. Childhood Memories: About 20 audience members in their seats are asked to write on a piece of paper a memory from their childhood (this be customized, for example at holiday events I asked them to write about the worst gift ever received). The papers are collected and placed into a net bag and one volunteer chooses to read several out loud (some can be very funny depending on the subject matter. Finally the volunteer picks one and does not read it out loud. I ask the volunteer to think about what is written on the paper and then draw it (in the air hidden from me). By I reading their muscle movements in their shoulder I draw on a white board exactly what they are drawing. 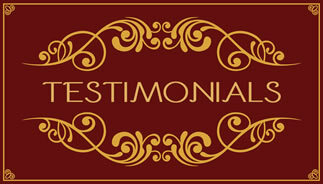 My mentalism routine can work on a stage or on the floor of a hotel ballroom or even in a restaurant. If you have an event that you want to make special with a mentalism performance call me for details. This show may be 30, 45 or 60 minutes in length. 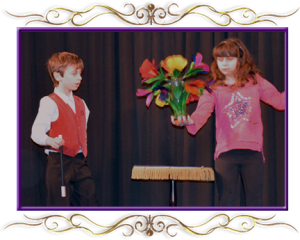 The Combs Family Magic Show is a magic stage show that is performed by my daughter Cecilia and son Peter as well as all three of us together. This show can include classic stage illusions such as a levitation effect, teleportation effect and the sword box effect. This show may be 40, 50 or 60 minutes in length. Mother Goose Lerning Centers, Children of America Daycare Centers, Stratford Public Library, Riverton Public Library, Lindsay Place – Enlivant, Woodbury Mews, V F W Post 7213, Salem County Adult Day Care, Christiana Care Adult Day Program, Mullica Gardens Assisted Living and the FIVE MINUTE FOLLIES. Family Magician is a magician who performs parlor magic or stage show magic that entertains many age groups (young children, tweens, teens, and adults) during the same show. Children’s Magician is a specialized aspect of parlor magic (magic performed in someone’s home) and is meant to entertain young children (3-7). It is typically performed at birthday parties, churches, preschools, elementary schools, Sunday Schools or libraries. This type of magic is usually comedic in nature. Strolling or Walk Around Magician is a branch of close-up magic where the magician roams a room or at an event and performs for groups of spectators. Strolling magic is also known as walk around magic. Although I do performed walk around mental magic/mentalism in general I do not perform walk around magic. Stage Magician performs for large audiences, typically within a theatre or auditorium. Large-scale props distinguish this type of magic along with the use of stage assistants. Mentalist is a magician of types that createsthe impression in the minds of the audience that the performer possesses special powers to read thoughts, predict events, control other minds, and similar feats. It can be presented on a stage, in a cabaret setting, parlor, before small close-up groups, or even for one spectator. Comedy Magician performs magic in a way, which is presented like a stand-up comedy routine. Based in Mullica Hill, New Jersey, as a magician Jim performs magic and mind magic / mentalism shows for social events, corporate events, preschool, kindergarten, elementary school & daycares, children’s birthday parties, weddings, senior communities and retirement homes throughout the New Jersey, Pennsylvania and Delaware in the South Jersey and the Delaware Valley areas including; Gloucester County as well as Salem, Cumberland, Camden, Cape May, Burlington, Atlantic, Philadelphia, Delaware, Chester and New Castle counties.